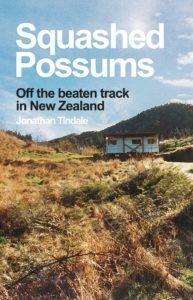 In an unexpected twist to the travel memoir, ‘Squashed Possums’ is narrated by a caravan in the wilderness. The book tells the story of the iconic Kiwi lone caravan and one young man’s misadventures in New Zealand’s most remote corner as he finds out what it’s like to live in a true wilderness, surviving in the most basic of conditions. Follow Jon through four seasons, including New Zealand’s coldest winter in decades. Discover how he finds himself hanging off of the edge of a cliff and meet the Maori chef who survived 9/11. Encounter hedgehogs that fly, possums that scream in the dead of the night and the Mystery of the Missing Moa. Find out how Jon is rescued in the nick of time from the cult of Caravanology by the affections of a good woman who opens a door to the local Maori world. Jon Tindale now lives in the suburbs of London with his wife Amy and son, William. He is eternally grateful for central heating and a house that can’t be blown apart by the big, bad wolf. He works in social media and in his spare time can often be found in National Trust houses where his friendly banter with the volunteers is often misconstrued as making untoward advances. Squeezed between Colombia in the north and Peru in the south, Ecuador is named for its location on the Equator and encompasses high Andean peaks, steamy Amazon jungles, and a long Pacific coast, as well as the world-renowned Galapagos Islands some 1,000 km off the coast. The landscape is so varied that Ecuador has been described as a microcosm of every microclimate found in South America. This diversity makes it a magnet for tourists, mountain trekkers, birders, volunteers, and increasing numbers of US retirees looking for a warm, culturally interesting, economical, and safe place to spend much of their time. What many people don’t appreciate is that the country is also a foodie’s paradise, with a cuisine as varied as the terrain. Signature dishes range from the sublime – such as Andean locro de papas (a creamy potato and cheese soup), coastal ceviche (fish or prawns marinated in lime), and hornado (whole roast hog) – to cuy (roasted guinea pig), a must-try Inca delicacy for all adventurous carnivores. In this presentation, I will give a visual tour of all the top travel spots and unique adventure opportunities on offer in Ecuador with a special focus on the tastiest treats available in each region of the country. Russell Maddicks is a BBC-trained writer, translator, and journalist. A graduate in Economic and Social History from the University of Hull, England, he has spent the last twenty years traveling, living, and working in South and Central America, most recently as Latin American Regional Specialist for BBC Monitoring. There is currently ongoing traffic chaos due to the recent Holborn/Kingsway fire. Please allow plenty of time to get to the meeting and check for the latest travel news.